There is still time to sign up for this year's Advanced Expository Preaching Workshop scheduled for Monday, October 6, 2014 in The Riley Center on the campus of Southwestern Seminary. 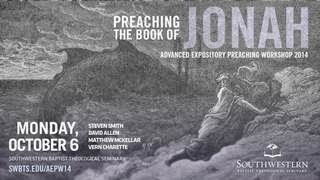 The focus of this workshop will be the book of Jonah. Registration, including lunch, is only $25. For more information go here or call 1.877.474.4769. You can also email at RileyCenterCalendar@swbts.edu.